Create an image within a perfectly square canvas. Canvas height multiplied by the amount of colors must equal exactly 512. The amount of colors must be less than the canvas height. For example: 64 height x 8 colors = 512. It's time to vote for the latest pixel art challenge: GBAnniversary. Thanks so much to all who took the time to vote and participate in the challenge! Check out the Beautiful Couché forum thread for more information. I just released a tutorial about animating Duelyst attack animations. You can check it out HERE! It goes over everything from key framing to special effects. Hopefully some of you will find it useful! With some help from the forum, longtime PJer Pixel_Outlaw (pOpO) just released a little puzzle/logic game Shufflet on Steam Greenlight. Now with a 10% discount until the 27th of June! This month is the 15th anniversary of the Game Boy Advance's release in the West. So, this week, create a pixel art 'de-make' of an already-existing polygonal game. Canvas size - Max 240 (horizontal) x 160 (vertical). It's time to vote for the latest pixel art challenge: Beautiful Couché. Thanks so much to all who took the time to vote and participate in the challenge! Check out the The Food Level forum thread for more information. This week, try to cheer up this misunderstood colour by using it in an image that depicts beauty. It can be a person, an animal, an environment - anything that you find beautiful. Thanks to DawnBringer for linking to this article about the colour (WARNING: don't click the link if you have a weak stomach). It's time to vote for the latest pixel art challenge: The Food Level. Thanks so much to all who took the time to vote and participate in the challenge! Check out the Gems forum thread for more information. Caladium, has created some great looking assets as part of the team on the just released Ara Fell: character sprites, animations for battles and cut-scenes, enemies, more tiles, etc. Create a mock-up of an original video game showing a screen from a food-themed level. 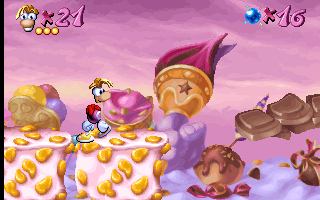 A good example from the first Rayman game. It's time to vote for the latest pixel art challenge: Gems.